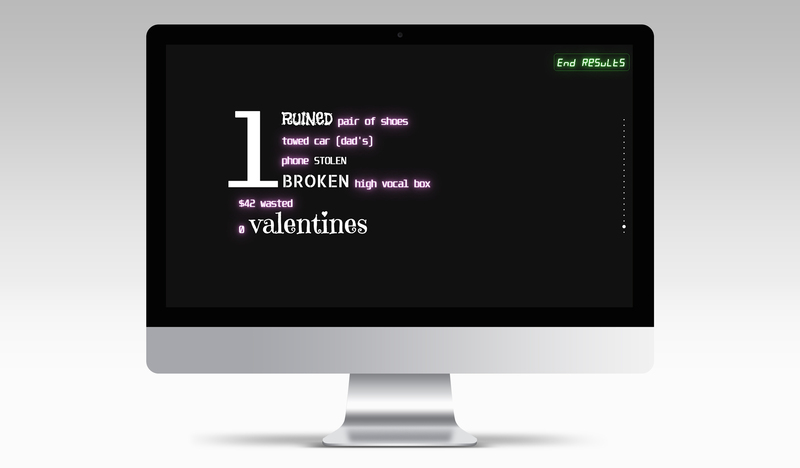 The objective was to create a visual portrait of a personal incident via a one page website using typography only. Part of this included mixing font weights, sizes and styles to express various texts&apos; meaning visually. The overall story is linear, narrating the declining health of vocal cords on a cold Valentine&apos;s Day. The story is also divided into numerous page sections that move from one section to the next via a scrolling effect. Some specific words are resized for higher attention or have various fonts and animations implemented via CSS to enhance the overall typography experience.